Time to look back on the times and trials of another of our illustrious VISTA alumni. This time we hear from Ivars Balkits who worked in the Trimble office in Media and Publications from June 1996 to May 1999. "While I have a lot of great moments that I remember from my service, probably the best one is my first impromptu meeting and excursion to the Glouster Cemetery with the Arts and Heritage coordinator at that time, because she is now my wife! The Rural Report newsletter was more or less my main project. I loved putting it together every other month and writing and reporting on all the great community development projects spearheaded by Rural Action, Partners in Leadership Development especially. I liked reporting on, and visiting with, the wonderful folks in Pike County who, with VISTA Marilyn’s help through the PLD program, learned to be proud of their heritage and organized a community center. The 1998 flood occurred during my service, and Rural Action became an emergency help center for the communities in Trimble, Glouster, Jacksonville and Amesville on the other end of route 329. The Trimble office coordinated food, water, health care, clean-up, FEMA aid, etc for those areas. Rural Action helped a family clean up their devastated home in Trimble. Everyone who worked on the reconstruction of these communities shared a bond. That memory will stay with me. From my VISTA service, I learned how important it is to leave a legacy of the work you do for those who come after you. That way, the next person knows how the work was done previously and has that information to work with. I am currently a gardener on a ranch in Northern California and have been living as simply as possible for many years. Sustainability is always on my mind. I grow food, herbs and flowers using organic methods and prepare the soil for the next growing season. 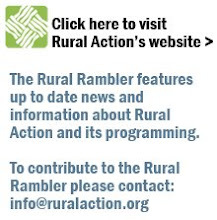 As a media and publications VISTA, I worked on Rural Action’s message and mission. We came up with 50 definitions for “sustainability.” Quite a few folks were for chucking the term entirely - too many syllables. Here it is, though, in the greater public discourse at last, though still not entirely understood. It’s happening here in California certainly. Eating healthier, working healthier, and relating to each other in healthier ways. I think we have succeeded, and I think we VISTAs have been a significant part of these changes." Another great story in the history of Rural Action VISTAs. Come see these movers and shakers at the big party on the 26th!